If You Are Operating An Online Business, Then This Tome Of Strategies And Secrets Is An Absolute "MUST HAVE!" Go to a bookstore, any bookstore, and tell me which among the paperback copies would catch your attention best. Read a catalogue, any catalogue, and tell me which among the offers therein would pique your interests. Go to the mall, any mall, and tell me which among the retail shops you encounter would make you want to visit them and spend on what they have to offer. The books with the most colorful and the most elegant covers. The books that are of amazing value but are being offered at splendidly low rates. The items which give out bonuses. The items which offer fabulous discounts. The items which are grouped together in bundles that are being offered at a bargain of a price. The stores that are on sale. This is the point I want to drive across. Often, one aspect of marketing in general is overlooked... and that is the way the products are packaged. Packaging your products carelessly (as is the case with a mentality like "okay, I already have the product ready, it's time to market it!") would be fatal for your business. Your market, you see, will base their decision on how they perceive your product. If it looks bland, they won't buy it. If they have some interest in the product, but they don't find the package as valuable as the selling price, they won't buy it. If they just chanced upon your sales page that presents a product which may be of use to them, but the packaging seems stale, they won't buy it. This is the content of 95% of the Internet marketing lessons available on the Internet. But these steps are deficient. Marketing your products immediately after creation seems rushed. And surely, your audience will not want a rushed product. You Should Also Be Able To Listen To What They Want. Will they find my product valuable? Will they find my product worthy of their time? Will my product even be enough to warrant their attention? Will they find my product hard to resist? Will they see the real value of my product? We may believe in the products we offer, but we must show how confident we are with our products. Writing this down on your sales page is not sufficient. You need to do something more. You need to give your audience something that they want, something that they will notice even from afar. And how are you supposed to do this? Packaging is an all-encompassing term that includes all manners of presentation for better sales results. 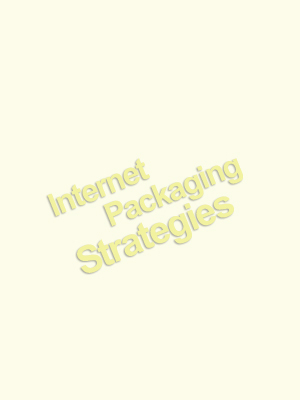 Mastering packaging strategies is an essential requisite for Internet marketing success. After all, what your customers will see is what will help them decide if your product is worth the purchase. If you present your product in a so-so manner, how will you be able to convince them that it is worth their hard-earned money? It's not enough that you drive a lot of people to your sales page. You have to come up with ways that will make your offer more attractive to as many people as possible. And this can be done by studying and learning the art of efficient packaging for the Internet audience. ...if they are employed correctly. Your Most Important Purchase Of The Year! So how are you to learn about these packaging secrets and strategies and the proper way of putting them to good use? Increase Consumer Confidence Through Responsive Presentation Models! In the pages of this very novel and exciting eBook, you will be able to discover the many potent packaging techniques that will surely pique the interests and win the favor of your target market. The strategies in this guide are presented in a scientific, clear, and succinct manner. It was written with the Internet marketer in mind, regardless of his or her tenure in the industry. Whether the online businessman is a novice or a veteran, this eBook is packed with astonishing tips and tactics which he or she can use for his or her Internet enterprise. The psychology of packaging techniques. Simple ways to determine consumer behavioral patterns. A step-by-step guide on writing your own sales page to reflect the value of your product and all the extra trimmings you want to include in your offers. A section dedicated to the different kinds of rights you will encounter in Internet marketing. Packaging models that you can copy. You'll be astounded by how enticing these approaches can be and you'll be excited to employ them at the soonest possible time, what with the enjoyable manners by which they can be facilitated and the fantastic rewards each of them can promise. A detailed guide on bonuses, which includes techniques on how to seek them out, how to get the best deals, how to use them properly, and how to include them in your offers to ensure the best response rate possible. A detailed guide on novel marketing techniques like urgency marketing, time-sensitive offers, and redemption bonuses. A detailed guide on how to create your own membership website. Several post-sales services you can employ to ensure consumer confidence. Win more customers by guaranteeing that their interests will be protected! Powerful tools that you can use to give you the edge you need for your packaging concerns. Never before has a product been released that deals with the very important matter of packaging. 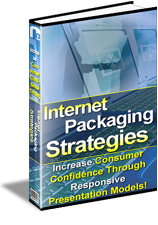 This is the first time in Internet history where all information about tactics that will help you present a product that your audience will find worthy and all information about strategies that will help you increase your response, conversion, and sales rates through amazingly effective packaging models, have been included in one volume brimming with everything that you need to know about this very essential aspect of online business. You have never seen an eBook like this before! Read it today and learn how packaging your products can bring about the realization of your dreams.